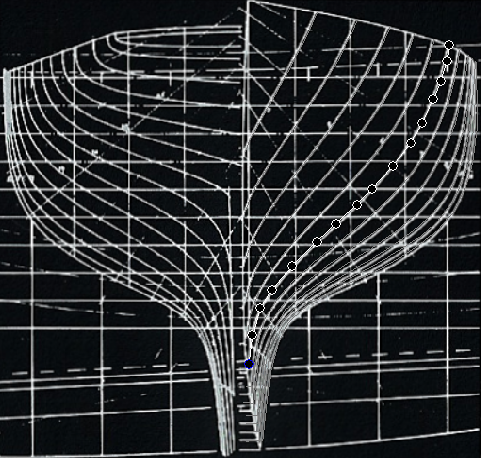 While surfaces and solid models may have become the modern standard of representing hull forms, hull sections remain a simple solution supporting calculations and other basic operations. They may be used as a starting point for generating a surface and can be created easily by measuring from plans, tables of offsets, created from geometry or imported from other software. Table of Offsets produced for reporting purposes. Modern software has turned its back on Sections leaving users to manipulate data in Spreadsheets or CAD software with neither tool providing a full range of capabilities. Section manipulation has been a key capability of PolyCAD since its inception with the application proving interfaces to import, edit, cut up, join and reformat groups of polylines before performing analysis or preparing the data for an export file format. Electronically stored section offset data can be imported in a number of ways. A variety of industry standard file formats are supported, including DXF, IGES as well as marine specific formats such as BRITFAIR and GHS. There are also a number of academic formats. Coordinate data pasted from formated text data in the clipboard. Offset data in Comma Separated format can also be imported supporting the entry of offsets data from spreadsheets. 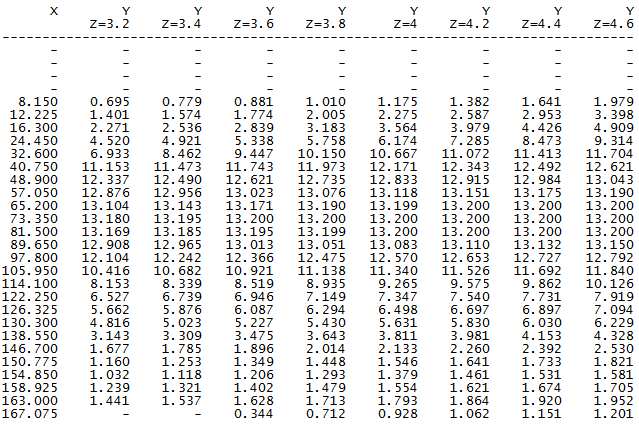 The Paste from Clipboard option supports the import of numerical offset data. An attempt will be made to determine the format and structure of the data which will then be used to offer different geometric elements as options to represent the data. Body Plan Image displayed inside the design environment allowing tracing of sections. Sections may, of course, be drawn in the software individually and grouped together. All surface elements are capable of producing contours which may be extracted and processed into formal section data. Sections may be traced from Lines Plan images imported into the software and assembled in 3D. Point Clouds from optical surveys, such as Laser Scanning, may also be sliced and section information produced. Sections are represented using the Polyline Group/List Element. The Editing tools provided are a subset of those used to for individual Polylines. Points can be manipulated using mouse or keyboard with the Entity Properties providing selection for the currently selected Section (Polyline) and associated coordinates. The Polyline Group/List Element is not intended to provide detailed editing tools for section coordinates since a group may be easily "exploded" as individual polylines and edited with a wider range of tools. The Polyline Group/List does, however, provide a range of tools that operate on the group of polylines as a whole. In addition, there is are a wide range of context sensitive group operations that may collect selected Polylines together with different transformations or include a selected Polyline in an existing Polyline Group/List. Polylines are collected together by selecting the Polyline Group or Polyline Hull option on the Right-Click menu. The Group option simply collects the Polylines together while the Hull option will collect the Polylines and also set the Mirror option. When the Mirror option is enabled the sections are assumed to define the hull on one side only and a mirror image of the sections is drawn on the other side of the centre plane. A number of operations will produce a Polyline Group/List if the results produced generate more than one polyline. Sort By X Location: This function organises the group so that the position of the polylines in the group/list is in ascending X based on the coordinate of the last point on each section. The last point on each section is assumed to be at the deck. Joining multiple polylines lying on the same X coordinate together, either at the centreline or by a zero thickness segment if there are any closed loops. A consquence of this operation is that sections are sorted sections by ascending X.
Rounding coordinate to the nearest millimetre. Removing collinear points, i.e. additional points on straight segments of sections are removed. Determining the section Start point, as described above. There are also a number of Closing/Unclosing routines which will add/remove points connecting each section to the centre plane, or only the 'Deck' connection and close/unclose the polylines as unique loops. The order of all points on each section can be reversed as an operation. Polyline Sections may be Sliced into parts using Principle Planes or named Plane Elements. This, for example, allows symmetrical definitions to be cut in half at the centreline to produce the half hull required for some applications or to slice Sections to the waterplane. Slicing a Polyline Group to an inclined (water) plane. Uncontrolled number of points on each section can be a source of trouble particularly in older analysis software which doesn't use dynamic storage and used fixed array sizes. Furthermore, disorganised distances between points can introduce numerical noise which many cause calculations to produce unreliable results. 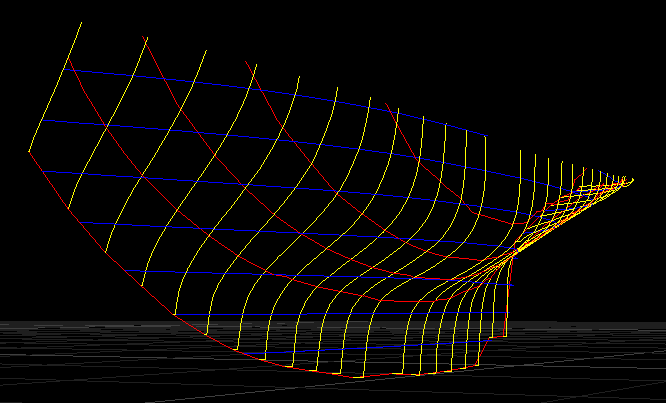 Generating sections from surfaces will often produce curves with a large number of points. PolyCAD features a tool to control the spacing of points on each section of a Polyline Group/List. Spacing can be controlled by either the maximum number of points or a desired spacing of points along each curve. Both of these approaches will reposition points on all curves. The Maintain Shape option removes points with smallest curvature compared to other points until the desired number of points is reached. Removing Colinear Points removes any additional points found to be within a straight sequence of points. Knuckle points can be detected to avoid the clipping of corners when points are repositioned. The Waterplane option may be used to reduce points when using hydrodynamics/sea keeping software which may be limited by the number of underwater points but above section portion should be retained. Various options for reconfiguring the point spacing on a Polyline List/Group. 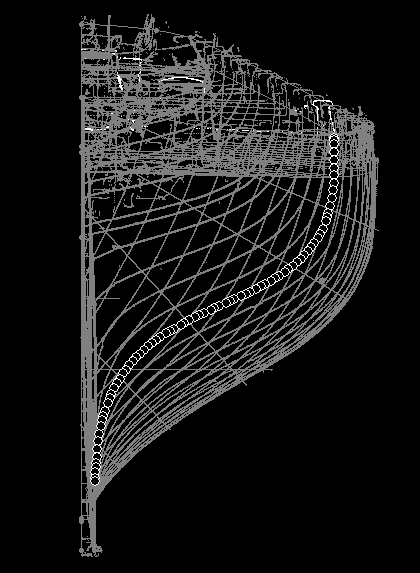 In addition to respacing points on sections, the section themselves can be respaced along the length of the implied hull form. The number of sections or the section spacing is the parameters to this process. Sections are respaced by determining the position of the new curves by equally dividing up the length of the element. Sections are then generated by connecting the points of one section to the next by an orderly sequence of lines. 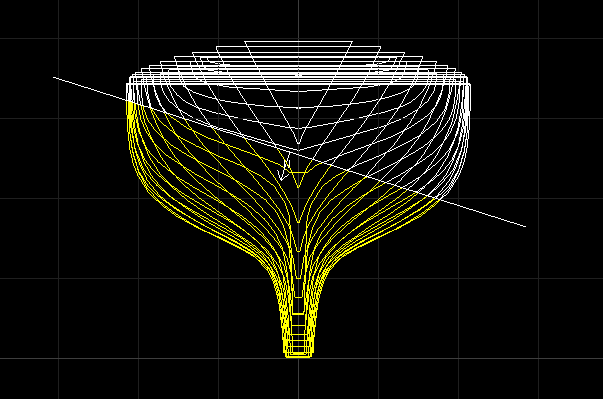 New sections are generated by the intersection of those lines with a transverse plane. Options for reconfiguring sections spacing on a Polyline List/Group. The process, described above, used to link adjacent sections may be used to generate a facetised representation of the hull sections. Neighbouring links are used to define a three or four sided facet. The operation takes parameters that determine the identification of knuckles and spacing of points along sections before they are connected together. The ends of the sections can also be capped by filling an individual section with polygons. 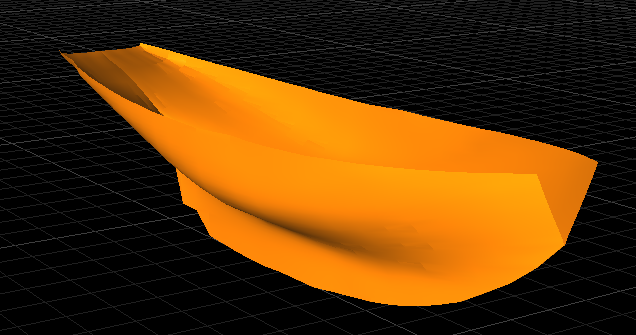 Generating polygons from sections is useful when visualising a hull form in 3D during post-processing of analysis. The generated Polygons may be exported to a number of different file formats. With the possibility of generating Polygons available, 3D contours of the resulting surface may also be produced allowing low quality but representative Lines Plans to be created. Polyline Groups/Lists are the primary representation used for hydrostatic calculations. All elements capable of hydrostatic calculations will produce "Calculations Sections" geometry upon which the analysis will be performed. Calculation Sections are generated by extracting an initial number of uniformly spaced sections from a Surface element. The accuracy of the volume integration is analysed and sections inserted until the estimation falls within a tolerance. Calculation sections automatically include both sides of the vessel if the element is determined to have symmetrical properties. 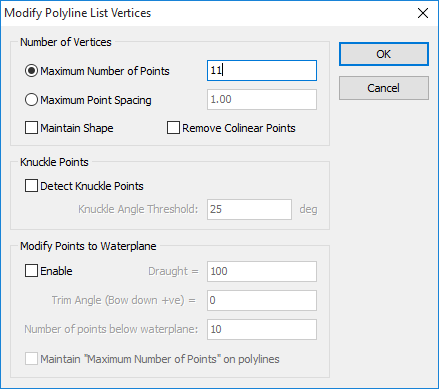 Calculations should be checked before performing any analysis within PolyCAD to confirm that the software has interpreted the surface geometry correctly. Calculation Sections may be extracted as separate Polyline Group/List elements from a surface, modified to correct any undesirable characteristics. They can be sliced on the centre plane to retain the half hull definition and used within other analysis software. Polyline Groups/List may also be used to represent Compartments. Presently these can only be generated using the macro language given the complex nature of these types of definition and the ease in which the process can be scripted. A Compartment visualisation option is provided which attempts to present the sections as if they were representing a closed volume, with the edges of the shape being presented. Sections based compartments generated using macros and displayed as implied spaces. PolyCAD makes limited use of Compartments presently. Traditionally they have been used to generate definitions for external software. The hydrostatic code used in PolyCAD does support compartments for Loading and Damage stability but this functionality is not exposed in the User Interface. The options to export section data in various file formats is similar to those used to import. Sections can be exported as Polylines in most generic CAD file formats and a number of marine specific formats are supported for other Marine CAD systems and specific Academic tools. As mentioned earlier, for the purposes of visualisation sections may be converted into a facetised data and exported accordingly.